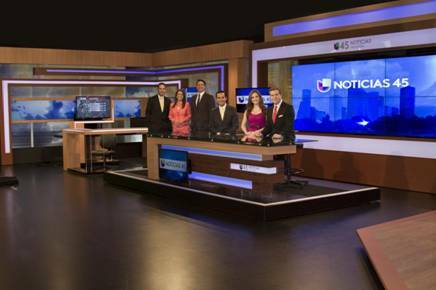 KXLN-TV, the Univision affiliate in Houston, has debuted a new set. The new studio, designed by Sabca Productions, is similar to designs the design form has done for other Univision stations, including its New York City affiliate. The Houston set, meanwhile, boats a 2×3 monitor array behind the anchor desk and large weather center backed with printed graphics. The entire set is framed with two toned wood finishes and backlit LED lighting system.